THE PBA has banned referees Edward Aquino and Rommel Gruta for the rest of the PBA Philippine Cup, admitting the officials missed calling a five-second violation and a stepping infraction on GlobalPort guard Stanley Pringle in the final play of an 84-83 overtime win over Ginebra on Sunday. The suspension means Aquino and Gruta will not be able to officiate for a maximum 21 games and a minimum 15 as the season-opening conference goes to its Final Four phase with best-of-seven playoffs pitting Rain or Shine against San Miguel and Alaska against GlobalPort. Commissioner Chito Narvasa and the league's technical committee handed out the suspensions after a meeting with all the referees who admitted a five-second violation or stepping call should've been called as Pringle struggled to free himself out of a double team put up by Ginebra's Sol Mercado and Greg Slaughter. 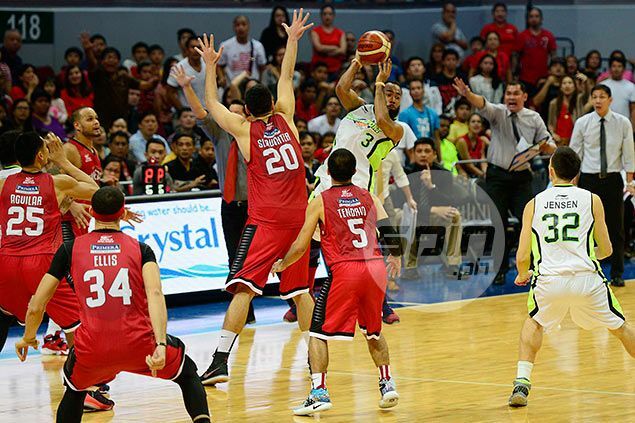 The referees admitted they erred in failing to make either call and apologized for the lapse, the PBA said. According to PBA media bureau chief Willie Marcial, Gruta was the wing referee closest to the action and should've called the five-second violation on Pringle. Aquino, being the crew chief, should have helped out in the play and put himself in a position to call the stepping violation on the GlobalPort guard, the league official added. The third referee on the floor, Bing Oliva, was spared from punishment because he was far from the action, league officials said. The PBA admitted the referees' blunders cost Ginebra a final possession - with, as per Spin.ph estimates, would leave them with 2.2 seconds if a five-second violation was called and 3.3 seconds if Pringle was slapped with the stepping violation. However, Ginebra has declined to file a protest based on the non-calls.